Remove product tube from package. Holding tube upright, twist off cap. Invert tube over dog and use open end to part dog’s hair. Apply one tube (1.0 ml) of product solution as a single spot or stripe to the dog’s back between the shoulder blades. Squeeze tube firmly to apply all of the solution to the dog’s skin. Wrap tube and put in trash. USE ONLY FOR DOGS BETWEEN 5 AND 15 LBS. AND OVER 12 WEEKS OF AGE. Apply one tube (1.5 ml) of product solution as a single spot or stripe to the dog’s back between the shoulder blades. 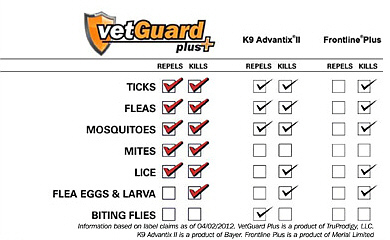 USE ONLY ON DOGS BETWEEN 15 AND 33 LBS AND OVER 12 WEEKS OF AGE. Apply the entire tube (3.0 ml) as a continuous stripe to the dog’s back starting between the shoulder blades and ending in front of the base of the tail. USE ONLY FOR DOGS BETWEEN 33 AND 66 LBS AND OVER 12 WEEKS OF AGE. Apply the entire tube (4.5 ml) as a continuous stripe to the dog’s back starting between the shoulder blades and ending directly in front of the base of the tail. USE ONLY FOR DOGS OVER 66 LBS AND OVER 12 WEEKS OF AGE. DO NOT USE MORE THAN A 4.5 ML DOSE REGARDLESS OF DOG’S SIZE.